The University of Western Sydney Quidditch Club became champions on Sunday 21 April when the Tri-Wizard Tournament flew into the Kingswood Campus. The Tri-Wizard Tournament is held monthly and rotates between participating universities. This month, the University of New South Wales, University of Technology Sydney, Australian National University, University of Wollongong, Newcastle University and Macquarie University descended on UWS with broomsticks, quaffles and bludgers in toe. The April Tri-Wizard Tournament was the UWS Quidditch Club’s first tournament win, with both their field Quidditch team and wheelchair Quidditch team snaring the snitch in their respective grand finals. Team member Hannah Monty says the team were excited to finally walk away as champions. The UWS Quidditch Club was established in 2011 and trains on the Kingswood campus. As active members of both the Sydney Quidditch League and the Australian Quidditch Association, their aim is to participate in the QUAFL Cup in December. The UWS Quidditch Club encompasses over 14 players, plus supporters, from a range of UWS courses including engineering, IT, social science, law, education and policing. “Quidditch is a great team sport – there is no way you can make any individual attempt at a goal, the whole game is team based,” says Hannah. Hannah, a third year Bachelor of Social Science/Bachelor of Law student, was one of the team members responsible for moving the club from the Campbelltown campus to the Kingswood campus, registering the team with the Sydney Quidditch League and the Australian Quidditch Association, and also teaching the players the official rules of Quidditch. Except for actual flying broomsticks, Quidditch is played in the muggle world just as it is in Harry Potter with team members filling the roles of keeper, beaters, chasers, seeker and snitch. They use quaffles to score points, and bludgers as a defence technique against the opposing team. Once a seeker has managed to catch the acting snitch – who is able to taunt the seekers with anything from throwing food to riding away on a bicycle – the game ends. 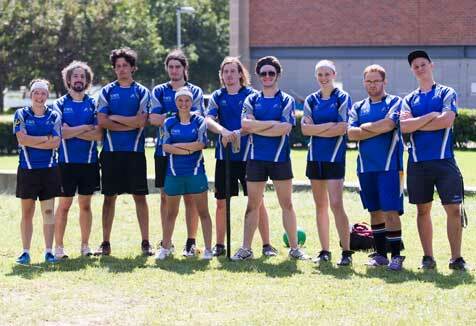 The UWS Quidditch Club will continue to participate in Tri-Wizard Tournaments in the lead-up to the QUAFL Cup. You can follow their progress here.